Concealed Carry Printing - Relax. Your Pistol Isn't That Obvious. If you hang around the concealed carry crowd for long, you’re likely to hear about the issue of “printing”. That’s the informal term that describes when the the outline of a gun is visible through a garment even though the gun is technically covered. This is generally considered a bad thing, and many people will go to great lengths to ensure that their carry gun isn’t printing before they venture out into public. 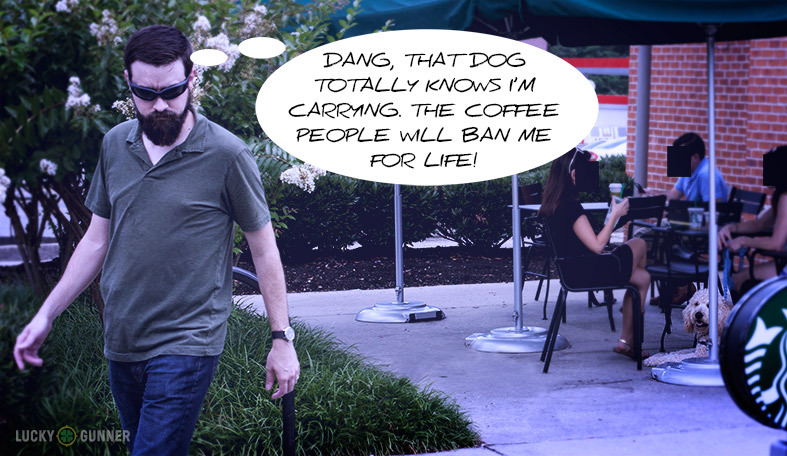 After having taught concealed carry permit classes for a few years, I learned from former students that this sentiment is not uncommon among first-time carriers. Assuming you carry on a regular basis, the paranoid feeling eventually fades and stowing a blaster in your trousers every day becomes as natural as getting dressed in the morning. But for most people, there is still a lingering desire to avoid getting “made” and having someone accidentally discover there’s a holstered pea-shooter underneath your shirt. If you’re worried that the slight bulge in your shirt is really obvious when you’re looking down at it, be sure to check in a mirror. From a couple of feet away, it’s probably barely perceptible. So unless you’re trying to carry a six-inch revolver in a spandex tank-top, a slight protrusion from the base of the grip that looks huge to your eyes when looking down at it will most likely blend in from the perspective of the people around you. With belt holsters being the most common method for concealed carry, printing is most likely to occur around the body’s midsection. Fortunately, in our society it’s generally impolite to stare at other people’s “crotchal region” and most people have a sub-concious aversion to letting their eyes drift toward staring at a strangers belt line. Even if your gun is blatantly printing, few people in public will ever notice. On the left, carrying a compact pistol with an inside the waistband holster, the outline of the grip is just barely visible, but unlikely to draw any attention. On the right, with a full size pistol in an outside the waistband competition holster, well… a few people might get suspicious. The only people who automatically assume that any object concealed under clothing is a gun are other concealed carry permit holders, and they’re certainly not going to give you a hard time. Okay, maybe some cops will notice too, but unless you’re acting like a complete moron, 99.9% of LEOs out there aren’t going to hassle you for a little printing. It’s unlikely, though possible that a “bad guy” might notice the lump under your shirt, but chances are he’s looking for an easy target and not interested in getting into a wrestling match with you over what may or may not turn out to be a gun. In states where open carry is prohibited, it’s often rumored that any degree of printing is illegal too, even with a concealed carry permit. In reality, this is almost never the case. Since printing is not a technical legal definition, it raises the important question of what exactly qualifies as “concealed”. Laws vary from state to state, but in most places, as long as you’re making a legitimate effort to keep the gun concealed from the average untrained eye, you shouldn’t have to worry about printing. 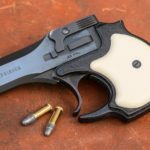 There’s a lot of overblown misinformation out there on this issue, so be sure to get your facts about state and local carry laws from a reliable source before making any assumptions. If you’re overly concerned about printing, then you might be prone to constantly checking and adjusting your carry gun. More often than not, this will only serve to draw unwanted attention to your heater, not keep it hidden. As our pal Say Uncle is fond of saying, “stop touching it“. If you behave as if nothing is there, then most other people will too. As always, a good holster and solid gun belt are key to maximizing the comfort and concealability of your carry gun. The setup should keep the grip of the gun close to your body to avoid excessive printing, and to keep the gun from moving around. Of course, you’ll probably have to “dress around the gun” to some degree, which may require going up one pant size, and avoiding excessively tight clothing. But with decent gear and some common sense, printing shouldn’t be much of a concern for the average legally armed citizen. 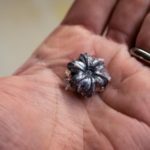 What Is A Boat Tail Bullet?